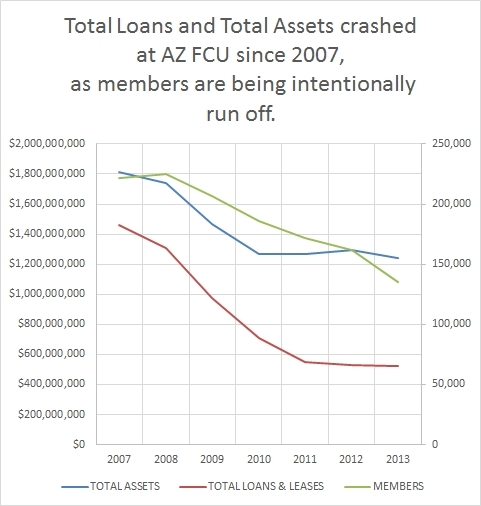 Total Loans, Total Assets, Total Members crashing at AZ FCU since 2007. Pitifully poor performance. | Arizona Federal Credit Union has a new $3 Monthly Membership Fee! Greedy fatcat managers are forcing members to pay a mandatory $3 ripoff fee every month, simply for being a member. That's not mutually beneficial. ← At AZFCU, the ratio of employees to members served is unfavorable and shows mismanagement. This entry was posted in charts images pictures, financials and tagged assets, AZ FCU, AZFCU, decline, declines, growth, leases, loans, loss, losses, member, members, membership, strategy, total. Bookmark the permalink.